I am haunted by words. Like monsters in a Haunted House, words jump out at me when I least expect it. Whether I’m reading, researching, listening, or singing, suddenly a word or phrase leaps off the page and holds me captive, making it difficult to think of anything else. Once captured, these words take up residence inside my head, stalking me relentlessly, regardless of where I go or what I do. While this lurking and lurching of words is at times unsettling, it is quite often a holy haunting I find myself in need of. Without meaning to, I keep singing this chorus over and over liked a crazed woman who only knows four lines of vocabulary. And although I have repetitively pondered the truth these lyrics contain, wiped away a great many tears of gratitude, and often said thank You to God for stalking me with reminders of His furious love...it appears that’s not all God wants. Seriously God? A double haunting?? Yes, God loves us with an “overwhelming, never ending, reckless love.” A love that woos and pursues us, that we cannot be separated from, that has absolutely nothing to do with our performance or worthiness, that forgives and forgets our shortcomings, comforts us when we need it, and sacrifices for us to the point of going to the cross and coming back for us again. He alone truly loves you and I with a forever kind of love. God wants us love others like He loves us. Wow. We, my friend, are in desperate need of regular reminders of how He loves us if there is any hope of us ever loving one another like that. We are selfish and self-centered, lazy, overworked, demanding, whiny, judgemental, imperfect perfectionists who demand from one another what we will not and cannot give in return. We perform good deeds to be noticed and thought well of, rather than out of humble gratitude for what God has done for us. We long for recognition and will toot our own horns if we feel others are not doing it loudly and often enough. We never have, do not now, nor will we in the future ever deserve His love. And yet, He loves us anyway. As we wrap up our month’s emphasis on missions, I am reminded anew that living missionally is more than just a mission statement, collection of good deeds, trip to a third world country, or special offering at our home church. Living missionally is as complicated and as simple as this. We must love others like He loves us. God, help us. This is Your mission for us, but it is one we cannot do. We cannot love one another like You love us. We just don’t have what it takes within in us. But wait...we must...we do if we have YOU! As Christ-followers, we take You and Your supernatural, God-sized love with us wherever we are. Shake us, God. Remind us that we are not walking through this dark world alone. Stalk and stay on us with reminders of how you love us personally. Help us to remember what we are so prone to ignore, accept, and forget. Surprise us at every turn with the height, depth, width, and wonder of Your love for our underserved selves. And please God, love through us like only You can. We are in desperate need of Your Holy Haunting. 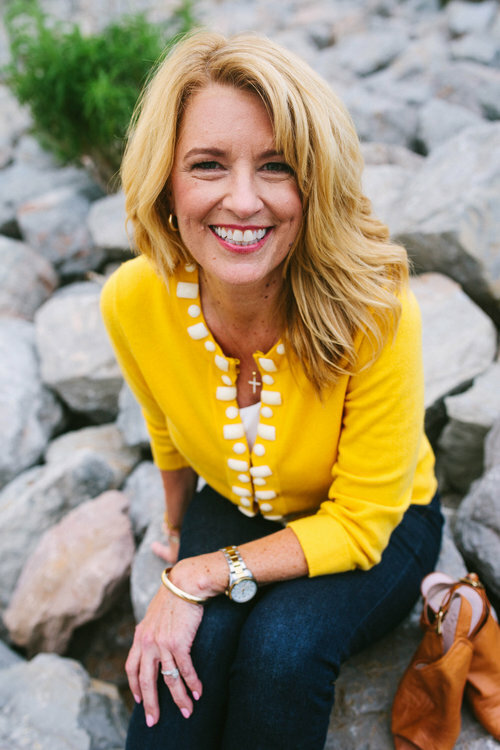 Bible teacher, author, inspirational speaker and disciple-maker, Vickey Banks is passionate about helping women connect the dots between God’s Word and their everyday lives. She loves serving as Women’s Ministry Director at Council Road, celebrating her people, playing with her puppy and getting lost in a good story.